The Oikos University massacre's victims may have received less of a police response than they might have if it weren't for a botched federal raid on the legal cannabis school Oaksterdam University, new documents indicate. 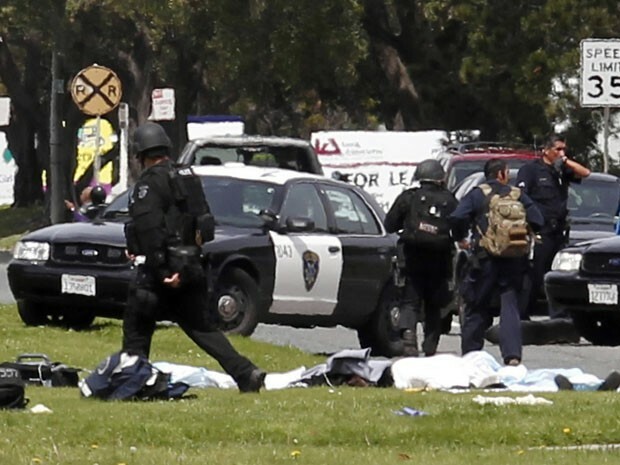 Armed federal agents seize textbooks as mass murder unfolds across town in Oakland April 2. Just a fifteen-minute drive away, at the same time the feds were raiding the Oaksterdam and sapping local forces, 43 year-old One L. Goh committed the third-largest mass killing at a university in United States history. The despondent, enraged Goh entered his former nursing school, Oikos University, at 10:30 a.m. with a .45 caliber pistol, intending to kill an administrator with whom he'd had a tuition dispute. Instead, Goh shot ten others, killing seven. Goh left the scene in a vehicle and turned himself in to police an hour later in Alameda, three miles away. This week, 24-year-old Berkeley software programmer Rich Jones released the explosive OPD emails on his personal blog. Jones said the contrast in enforcement priorities had infuriated him on April 2. As events unfolded that Monday, Jones used the Freedom of Information Act assistance site muckrock.com to file requests for information on the Oaksterdam raid from the Internal Revenue Service, the Drug Enforcement Administration and the OPD. The IRS denied Jones' request, stating that the it had no information, and Jones' DEA request is still pending. But the OPD responded by May 31, releasing a series of emails that show the federal government springing the raids on the OPD at the last minute — and then bungling them. Over the next two hours as the DEA removed evidence, up to a hundred protesters showed up with signs, chanting “DEA, Go Away!” Many blocked DEA vehicles attempting to leave with evidence. Two protesters were arrested. “I commend all sergeants and officers involved in this event for demonstrating professionalism and restraint whilst confronted with some very incorrigible and outright nasty individuals,” Wiley wrote. Alleged school shooter One L. Goh escaped and turned himself in. Meanwhile 7.6 miles away, Goh reportedly walked into the fundamentalist Christian nursing college and shot the front desk receptionist. Goh then allegedly entered a classroom and ordered students to line up against the wall before beginning shooting. The first police officer responded within ten minutes, reports state, followed later by a SWAT team. 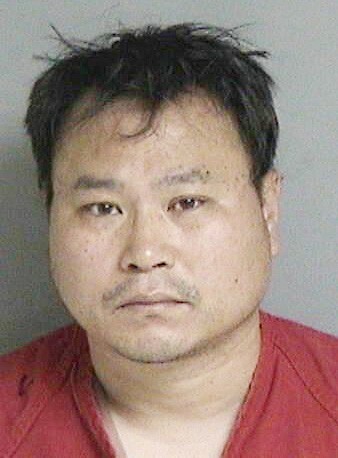 After the shooting, Goh drove himself to a supermarket three miles away in Alameda, where he reportedly confessed. As of June 29, Goh is being held for trial and has entered a plea of not guilty. At 2:26 p.m. the day of the shooting Lt. Wiley wrote a final note on the Oaksterdam raid, addressed to other OPD officers and the federal government. Lt. Wiley also noted that the Oaksterdam warrant could have been served at night, when it would have not drawn a crowd or sapped police resources. And finally, Wiley remarked that the multi-headed federal government appeared to lack coordination or direction, which further sapped OPD forces. Lastly, the DEA lacked an exit plan for its van-loads of evidence. The vans became a focal point of rage for protesters April 2. Jones said the documents show the federal raid sapping OPD resources. “He was a guy who got away. He wasn't arrested in Oakland. He was arrested in Alameda. There was not enough police response to this event,” Jones said. 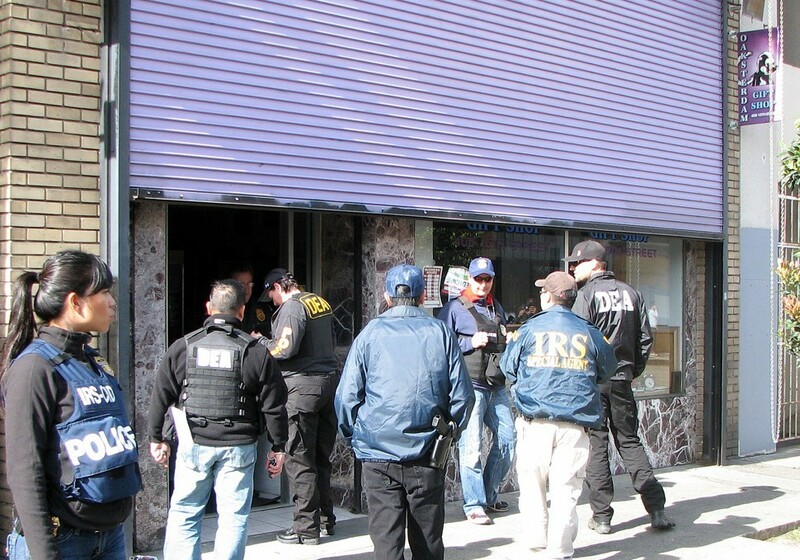 Federal agents bust up the Oaksterdam gift shop. Though medical marijuana is legal in seventeen states, cannabis is banned in the eyes of the federal government. The DEA and IRS did not respond to requests for comment during the raid, and generally haven't commented on their actions in California. In October, the four U.S. Attorneys for California announced a broad crackdown on medical marijuana businesses in California. Oaksterdam is affiliated with the city-licensed marijuana dispensary Coffeeshop Blue Sky. And Lee has said that his enterprises are also under a federal tax investigation for normal business deductions. The federal raid could lead to more charges. Attorney General Eric Holder has said his agents are only targeting business violating both state medical marijuana laws and federal laws. But that's a lie, reports indicate. Many model California dispensaries, like Berkeley Patients Group, and cultivation regulations, like Mendocino County's 9.31 program, have been targeted by the feds for elimination. As of press time, more than two months after the raids, they have not charged Lee. But they have crippled Oaksterdam and largely silenced Lee, who in 2010 took the eighth largest economy in the world to within 460,000 votes of legalizing pot. Paul Armentano, a Vallejo resident, spokesperson for NORML, and Oaksterdam lecturer, said Jones' documents show the OPD didn't consider Oaksterdam illegal. Federal officials should have respected state and local law. Armentano said the federal government is undermining efforts to control pot and increase public safety in the name of its War on Drugs, which the Associated Press reports has cost one trillion dollars and has failed. “Legislating medical marijuana operations and prosecuting those who act in a manner that is inconsistent with California law and voters' sentiment should be a responsibility left to the state, not the federal government,” he writes. Jones insists he's not “a medical marijuana person." But the people of Oakland and California have said they don't want scarce public safety resources spent this way, and apparently neither do Oakland police. “Even the police department [doesn't] like the Federal government coming in and doing this. And for what? And the fact that lives were lost that day? The priority is clearly all fucked up here,” Jones said. Jones will post the results of his DEA FOIA request if and when it is received.